Seems every time I go grocery shopping, I end up with makeup in my cart. I can't help it... Glitter is way more fun than cheese and Irish Oats. Anyway, these looked glittery so I ended up getting four of the five colors they had. There was a purple, a green, a taupe, a blue and this one, a pink, called Pink Punch. These are called Maybelline EyeStudio Color Explosion. Each palette contains four colors plus a coordinating glitter topcoat. 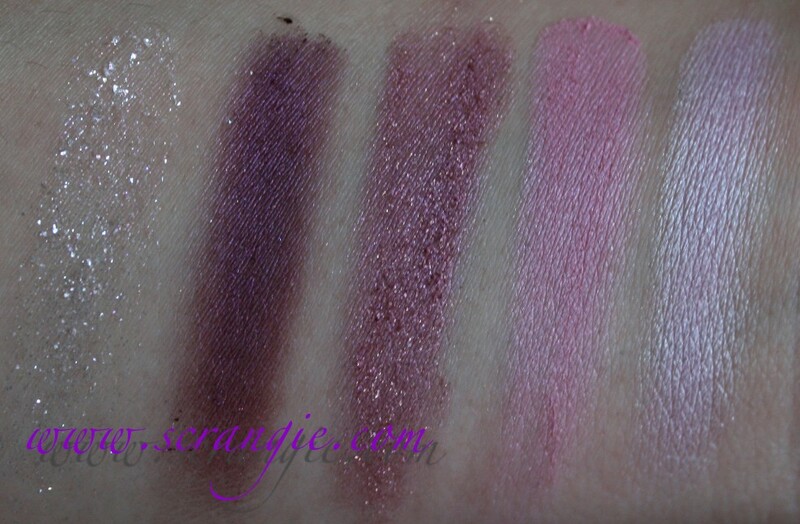 The Pink Punch palette is shades of pink and mauve. Swatched heavily over Urban Decay Primer Potion. The shade on the far left is the luminizing glitter topcoat and it's gorgeous. Sadly, the glitter was the best part of this palette. I tried wearing this and it was just... bad. The pigmentation is shamefully weak- this drugstore shadow palette costs $11 at Walgreens, but the pigmentation isn't even half as good as $2.99 Wet n Wild or $8 L'Oreal HIP. I actually feel kinda stupid for buying this. It was pretty much unwearable. The colors were so sheer and chalky and barely showed up, once you tried to blend them they were gone. The one redeeming factor is the glitter. The glitter is GORGEOUS. It's a combination of microglitter, flaky glitter, and iridescent regular glitter. Lots of different colors in it- pink, white, blue, purple. It doesn't stick on its own (flakes off and ends up everywhere BUT your lids), but over Fyrinnae Pixie Epoxy it's fantastic. I would return this if I didn't like the glitter so much. The other two Color Explosion palettes I've tried so far have been much better than this one (I haven't used the taupe yet), so they're not all this bad. But I really can't recommend the Pink Punch; the payoff and pigmentation are non-existent. If they ever sold the glitter by itself I'd be all over that. This is some really awesome glitter. It's a different glitter for each palette, too. Which is why, against my better judgment, I ended up buying four of these palettes even though I knew the shadow would be weak. These are very pretty, cant wait to get my hands to these. You and Grey both got this palette and disliked it. I however got the Caffeine Rush and Amethyst Ablazed palettes and LOVE both of them. So I will be staying well away from Pink Punch, thank you! 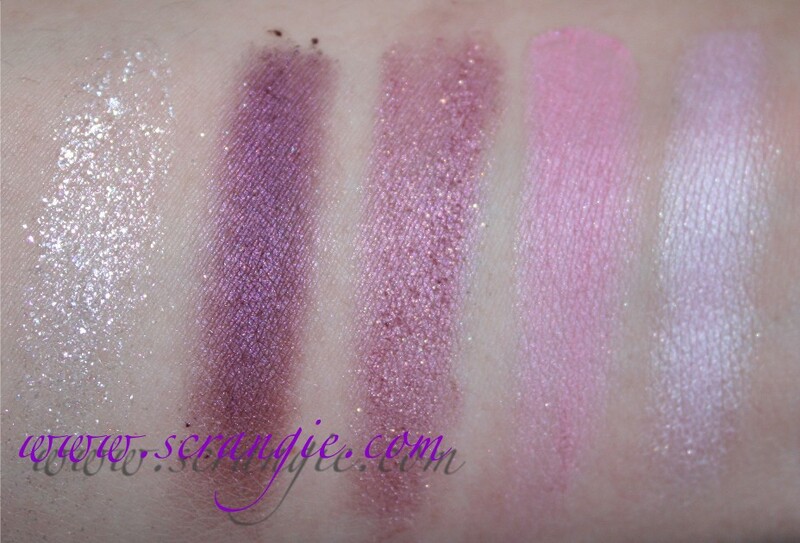 I didn't have this issue with this palette, but the Amethyst Ablaze (all purples) "blended" into a muddy mess. The blue and green palettes aren't bad, the brown is just okay... the green wins, though. I'm so glad you were kind enough to guinea pig for us! I saw an ad for these just these morning and thought, ooooooh. I won't buy one now! Why must drugstore shadows be so sheer? Are they afraid that normal folk like drugstore shoppers can't be trusted to handle highly pigmented colors without creating a race of clown makeup housewives? I haven't bought Maybelline eye shadow since I was a teenager. That's a long long time ago! I sure as hell won't be buying these. The colors look so pretty but I have plenty like this. I wanted to love this collection too but you are right, low color pay off, scratchy formula...loreal hip is my favorite of the drugstore brands!! I have Caffeine Rush and really like it- I do have to agree that $10 is a bit expensive for Maybelline to me. I am glad you swatched this! I was down the makeup aisle at the grocery store and saw these and *almost* bought one. Are you going to swatch the others? I want to see what they look like before spending the $10 on grocery store makeup! Renée, yes, I'll be swatching the other ones :) I have the brown, the green and the purple- is there a particular one you want to see first?